Landing craft are boats specialized for carrying troops, vehicles, and cargo to a beach devoid of port facilities. They did not exceed 150' (50 m) in length and had little oceangoing capability, so that they were generally launched from larger ships close to shore. Landing vessels larger than 150' in length were designated as landing ships and had significant oceangoing capability. Japanese doctrine called for landings against undefended coastline whenever possible. So did Marine doctrine during the "Banana Wars" of the 1920s. However, as Plan Orange was gradually developed through the 1920s and 1930s, it became clear to American military planners that a war against Japan would require assaults against heavily defended shores. The Tentative Manual for Landing Operations, which was published in 1934 and formed the foundation for Marine amphibious doctrine in the Pacific War, identified the development of suitable landing craft as the key to such operations. The Navy took some convincing, and it was not until May 1938 that the Navy took its first look at Andrew Higgin's Eureka boat. This formed the basis for the LCPL, the first of the specialized American landing craft that would see service during the war. By then, the Japanese had already made important innovations in landing craft design, which saw service in China as early as 1937. An American Marine officer, 1st Lieutenant Victor Krulak, somehow obtained permission to observe the landings south of Shanghai. He was accompanied by a Navy intelligence officer and a photographer who managed to get good photographs of the Japanese Daihatsu landing craft, and these were forwarded to Washington along with a lengthy report. The report gathered dust until 1939, when Krulak returned to the States and found the report in a file cabinet with a note that they had been send by "some nut in China" (Venzon 2003). Krulak approached Holland Smith, who brought the file to the attention of Marine commandant Thomas Holcombe, who examined it with great interest. There is little question the Japanese design influenced Marine thinking on what a landing craft should look like, but by this time Higgins had already begun independent development of his Eureka boat. The similarities between the Daihatsu and the Eureka boat illustrate how similar design imperatives can lead engineers to independently converge on the same solution. The British were more prescient than the Americans, and had experimented with tank lighters as early as 1920. This was the forebear of the LCM. The British developed the Assault Landing Craft (later known as the Landing Craft Assault or LCA) in 1938, though it was used exclusively in the European war. The British also developed the LCT, at Churchill's insistence, in 1940, and produced preliminary designs for the LST, the first of the landing ships, for production in the United States. 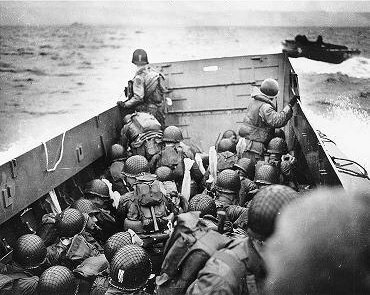 Allied landing craft became larger, mounted ever heavier weapons and began to be armored as the war progressed. A number of LCIs were converted completely to gunboats to provide close fire support during landing operations. The LVT, which was originally envisioned as a supply carrier, was found to be ideal for carrying troops across fringing reefs. Landing craft were one of the few really important items of military hardware that were not produced in nearly the numbers needed by the Allies. Although they were second in priority on the U.S. Navy's Shipbuilding Precedence List in October 1942, they had dropped to twelfth place by November and were not on Roosevelt's list of "must" programs for 1943. The British were exasperated by the slow rate of production, while the Americans distrusted the British figures on landing craft requirements, believing that the British demands were a ploy to postpone the invasion of northwestern Europe. King resisted increases in landing craft production until the QUADRANT conference of August 1943, when he finally agreed to cut back production of submarine chasers in favor of landing craft.